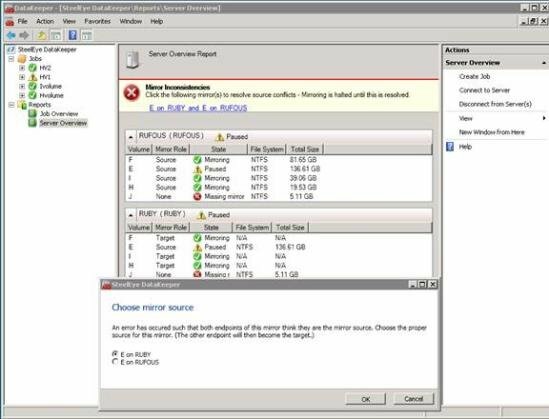 When protecting DataKeeper volume resources in Microsoft WSFC, if all nodes are included in the cluster split-brain recovery should occur automatically. However, in a Node Outside the Cluster scenario a split-brain may occur if network connectivity is lost to the DR Node. The user might choose to manually switchover the volume to the DR node while WSFC maintains the source on the original cluster node. When network connectivity to the DR node is restored there will be a conflict known as a split-brain condition where both systems assume the ownership role over the volume. The SIOS DataKeeper user interface will display the error “Mirror Inconsistencies – Click the following mirror(s) to resolve source conflicts – Mirroring is halted until this is resolved” (as shown in the diagram below). An invalid attempt to establish a mirror occurred. Both systems were found to be Source. The mirror has been paused or left in its current non-mirroring state. Refer to Extending a Clustered DataKeeper Volume to a Node Outside the Cluster for the recovery procedure.